The California gold rush began in 1848 when a work crew found a small gold nugget In the American River while building Sutter’s saw mill. 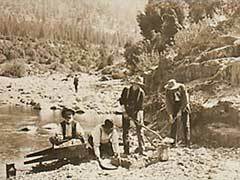 A few small, but natural gold nuggets were found in the soil of the river and thus began a migration of over half a million people converging on California in search of wealth. To further understand the gold rush it is important to know what is placer gold, since this is the type of gold that miners sought after. Placer gold is deposits found in the sand and gravel of modern or ancient stream beds both above and below the ground. 1. A shop keeper, Sam Brannan brandished a bottle of gold dust in San Francisco streets in May of 1984 and lit the hopes of hundreds of miners who rushed to the gold fields. 2. In 1849 while quartz mining in Mariposa gold deposits were found inside quartz veins and mining began in underground mines. Mining still continues in these mines. 3. In 1851 the California gold rush extended to the Greenhorn Creek in Kern County and California’s annual gold production reached $81 million. Mining continued during the early 1850s with the introduction of the first underground mining of buried river channels in Placer County. 4. In 1854 one of the largest masses of gold was discovered at Carson Hill. The mass of gold weighed 195 pounds and in 1859 a 54 pound nugget was found at Magalia. 5. During 1955 surface placers became exhausted and river mining took over accounting for high gold outputs until these rivers were mined dry in the early 1860s. 6. By 1864, California gold rush season was essentially over when the surface and river placers were mined out. For the next 20 years hydraulic mines took over the California mining industry. 7. To date California has produced more gold than any other state in the Union. This cumulates in 105 million ounces from 1848 through 1965. 8. Modern California gold mines are described as bucket dredge mining and this type of mining became the mainstay of California’s gold output until 1970. 9. The California gold rush of 1848 indirectly contributed to the colonization of the mountain west. As miners and families trekked to California, gold fever would diminish and setting down roots took over. 10. Gold mines in the USA give this country the distinction of being the third-largest gold producer in the world. Modern mines in Nevada now account for 80 percent of US gold production with mines in Alaska and Colorado contributing the remaining 20 percent.